Either way, we bought mini-bagels the other day and F&B love mini bagels, so they were the base for lunch. 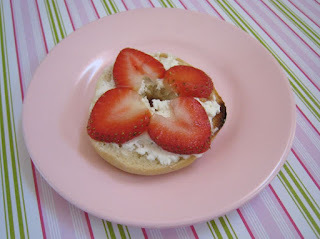 Faith has a mini bagel, toasted, and spread with whipped cream cheese and sliced strawberries. 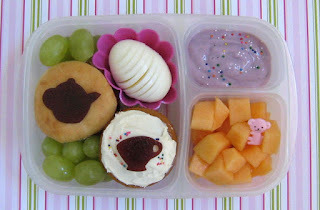 To go with it, she has a sliced boiled egg, blueberry yogurt with a dash of sprinkles, fresh cantaloupe, grapes to hold everything in place, the aforementioned pumpkin cupcake with a bit of cream cheese icing, and some tea party cutouts from organic blueberry fruit leather. Pretty, simple, and quite tasty! I thought this was kind of pretty, so had to take a picture--bagel with fresh strawberries!